- I have unabashed girl crush on Jessica Alba. I love the transformation she recently shared of her bedroom. - Summers is synonymous with pie. This one is total eye candy. - Ever get overwhelmed by Farmer's Markets.? Consider this your cheat sheet. - Think you know how many hours of sleep you should be getting? Think again! - Vintage cookbooks? Sign me up! - The Union Square Market has the freshest goodies around. Mr. C is currently on a honey comb kick, so I'm looking forward to checking out the weeks's sweet offerings. Here is a guide to the who's who on the market circuit. - This easy-peasy gnocchi recipe was a perfect work-night meal. - Humidity is par for the course on the East Coast. While I love it - especially when it stays warm after the sun goes down, humidity hair is never a good look. These ladies know the trick for lovely locks, regardless of vapor levels. - It's officially peach season! I'm drooling over this peach cobbler. - I'm always looking for the next book to read. I discovered this one at Barnes & Nobles the other day and have been intrigued ever since. One of our favorite ways to spend the weekend is going for a drive. This Sunday we visited some family upstate and made our way to Stone Barn near Tarrytown. 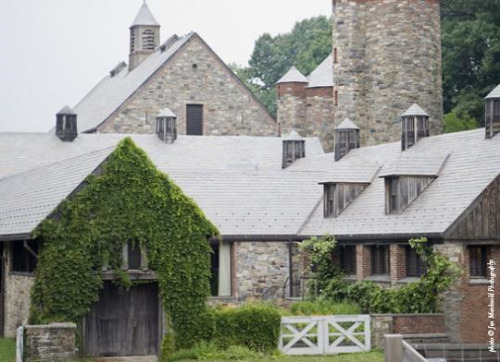 Originally a working dairy farm for the Rockefeller Estate in the 1930's (so they could have fresh milk at all times), Stone Barn Center for Food and Agriculture opened in Spring 2004 to help build awareness about everyday food choices, increase awareness of seasonal, sustainable food and train farmers in restorative techniques. Stone Barn is surrounded by 80 acres of idyllic green pastures filled with lambs, cows, chickens and geese, in addition to incredible gardens and stunning true-to-name stone buildings. You can check out the cafe for seasonal, fresh-from-the-garden treats, take a self-guided tour through the grounds, take a class (this one and this one could be great for families) or sit down at Blue Hill at Stone Barn, an amazing farm-to-table restaurant where the menu is ever evolving to what looks best that day. It's the perfect spot for the whole family and a special date-night for foodies. Entryway - Photo Source: Mr. C.